In this ancient parable from India, a forest-dwelling hunter learns that cruelty has consequences and that compassion has rewards. When the hunter meets the wise man Narada, “Do unto others as they would do unto you” takes on a very concrete meaning as the sage leads the hunter on an imagined journey in which the hunter becomes the hunted. When the hunter realizes how his actions affect other living beings, he has a change of heart and begins to live in peace with the animals he once pursued. KOSA ELY adapts this traditional Indian tale into an inviting narrative that presents the universal golden rule in a new and appealing way. Anna Johansson’s richly detailed illustrations evoke the animal kingdom and enchanted forests with fine lines and luminous colors. 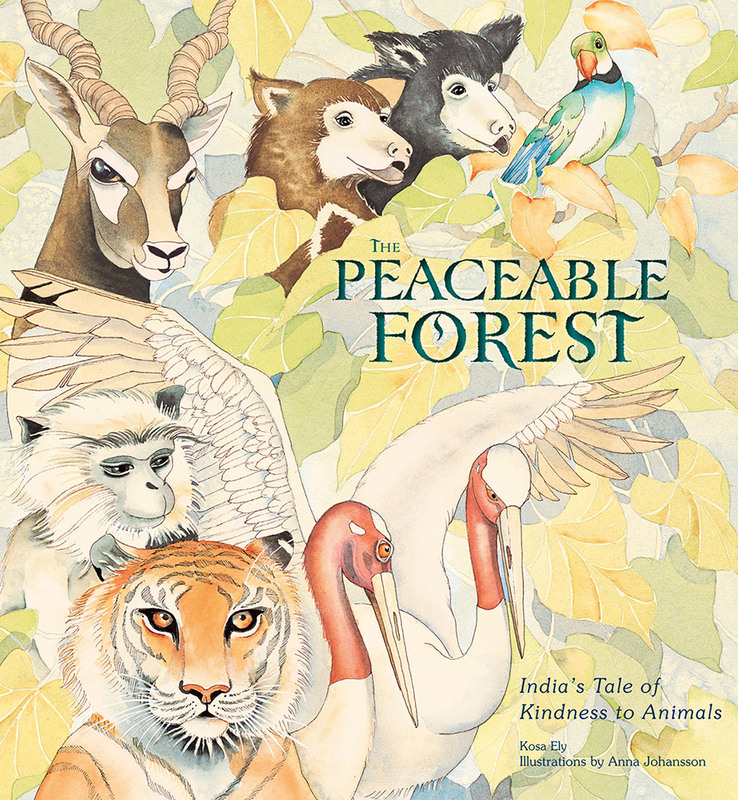 The Peaceable Forest is the ideal picture book to inspire young readers to respect life in all its forms. Click here to visit the book’s Facebook page! All of the animals in the illustrations are native to India: Sloth bears, Langur monkeys, Blackbuck antelope, tigers, wild boars, deer, rabbits, chipmunks, tortoises, foxes, elephants, buffalo, panthers, and more. Look for these Indian birds: Sarus cranes, peacocks, Ring-neck Parrots, Blue-winged Malabhar Parakeets, Crimson Sunbirds, and Tailorbirds. Trees and flowers native to India include the Banyan tree, Magnolia tree, Date Palm tree and Tulasi tree. Along with practicing nonviolence, Narada instructed Mrigari to live a simple and pure life, serving the Tulasi tree and continuously chanting the Hare Krishna maha mantra. Several months later Sage Narada came with Parvata Muni to visit Mrigari. Overjoyed to see his teacher approaching, Mrigari ran out to meet the sages. As he began to bow down in humility before Narada, Mrigari noticed ants on the ground, and began gently sweeping them aside with his cloth. The sages were pleased to see the complete transformation of Mrigari — he was now unwilling to hurt even an ant. 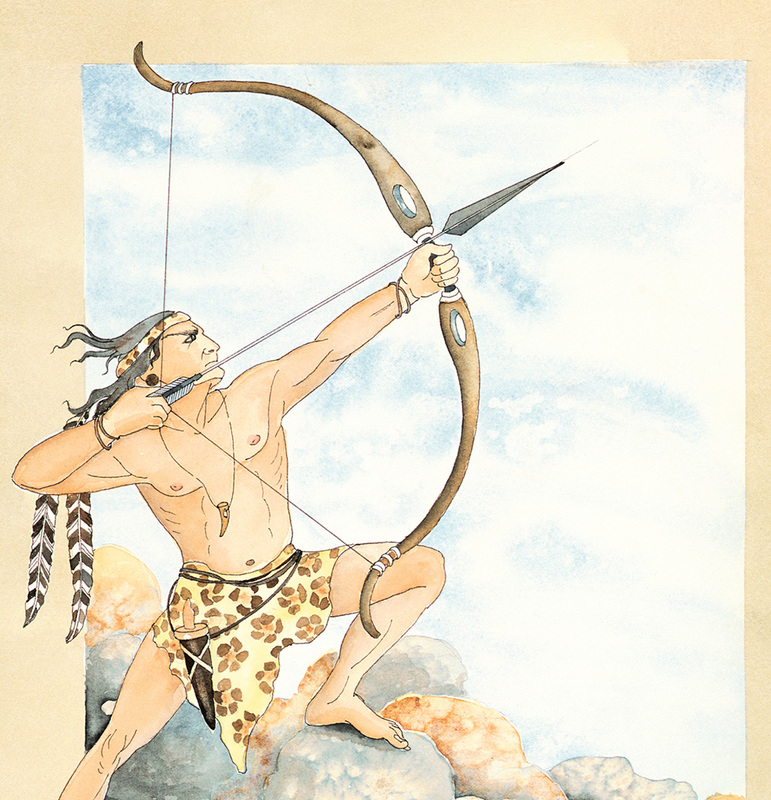 The history of Mrigari the hunter and Sage Narada took place more than five hundred years ago. Shri Krishna Chaitanya narrated the story to Sanatana Goswami, and Krishnadas Kaviraraja Goswami later recorded it in the biographical work titled Chaitanya Charitamrita in the Bengali language. The translation and commentary of these ancient texts by His Divine Grace A.C. Bhaktivedanta Swami* are the basis of my retelling. 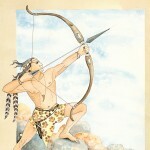 In 1976 I had the good fortune to read The Teachings of Lord Chaitanya, and to contemplate the hunter’s deliverance. Already a vegetarian and proponent of non-violence, I wanted to share the knowledge of karma and the blessings of the sages to others. Young and enthusiastic, over the next ten years I distributed more than 100,000 vegetarian cookbooks and yoga books extolling the benefits of a non-violent diet and way of life. From our temple kitchen and restaurant in Laguna Beach we introduced local residents and international tourists to delicious, healthy vegetarian meals. We joined forces with fantastic vegetarian cooks to feed thousands of young people at festivals, Rainbow Gatherings, Grateful Dead concerts, and Sunday love Feasts. While in India we assisted Food for Life Global in vegetarian food distribution to tens of thousands of people in need. Editor Joshua Greene, Art director and designer Chrissy Kwasnik, Production Manager Jane Chinn, and the rest of the Insight Editions team. My dad, mom, husband, kids, sisters, and brother for being awesome. Inga Canfield, for believing in me, and making impossible things possible. Jack Canfield, for his mentoring and encouragement. Nitai Sharana, Kaisori Bellach, Raghu Consbruck, Govinda Cordeau, Pranada Comtois, and Chitra Gunderson for their friendship, advice and support. Reviewers John Robbins, Jack Canfield, Jai Uttal, Pia, Dr. Graham Schweig, Steven J. Rosen, Dr. Mega Subramaniam, Dr. Edith Best, H.D. Goswami, Mitchell J. Rabin, Kavi Noland, Kenneth R. Valpey, Paul Rodney Turner, Gaura Vani, Lynn Burwash, David Shapiro, Lauren Teller, Dr. Tanmay Lele, Vasu Murti, Dr. Vishal S. Vaidya. My spiritual master Srila Prabhupada, Sage Narada, and all the great teachers of ahimsa. And to all of you who offer blessings, who purchase books, give donations, share the book’s message, and practice ahimsa in your own life —I humbly acknowledge you and sincerely thank you.